Small, structured workshops: an improved learning experience? The need to define a curriculum, instructional plan, and training for future phlebologists has been obvious for years. In 2017, the European Union of Medical Specialists approved the European Training Requirement (ETR) in phlebology, which outlined an instruction plan. Training practices included hands-on training using phantom limbs, demonstrations on live subjects, videos on procedures, case discussions, and attending “live” procedures. We believe that the European Venous Forum Hands-On Workshop (EVF HOW) shows a model of instruction that can meet the goals set by the ETR. The basic principles of the EVF HOW are to include a low number of learners (100) to facilitate interactions with instructors (faculty: learner ratio is high [1:3]); to make the hands-on sessions truly hands-on for the learners; to promote informal and uninhibited communication between delegates, faculty members, and industry representatives; to provide sufficient time for discussions, with the greatest interaction occurring at the workshop stations; to encourage learners to bring clinical cases for presentation and discussion; and to include no exhibition or parallel activity. Success has not been measured by the number of participants, but by the impact on knowledge and practice. In 2014—2017, web-based tests with multiple-choice questions were performed before and after the workshops, showing a substantial 29% to 50% median improvement in the results. Although the strictly scientific presentations are important, training needs to be complemented by small group, hands-on courses, such as EVF HOW, for the practical management of patients with venous disease. The interest in acute and chronic venous disorders have markedly increased, especially in the last decade, with the introduction of duplex ultrasound scanning, the development of minimally invasive techniques to treat venous diseases and disorders, the increased awareness about the impact of venous disease on patients’ quality of life, and favorable reimbursement schedules. Variousspecialties provide treatment of a multitude of disorders, but few have a comprehensive approach to disease in the deep and superficial system. For years, there has been an obvious need to define a curriculum, instructional plan, and training for future phlebologist. In 2010, the International Union of Phlebology published a Phlebology Training Curriculum,1 and, in 2012, the American Venous Forum suggested a Venous Curriculum.2 However, none of these were implemented in the community. In Europe, major progress in this aspect was achieved in October 2017 when the European Union of Medical Specialists approved the European Training Requirement (ETR) in phlebology, which was presented by the European Board of Phlebology.3 This was the final step in a long process. This process that started 2015 with the Multidisciplinary Joint Committee in phlebology led to the creation of the European Board of Phlebology in October 2016 under the leadership Jean- Jerome Guex (France). The board set up an ETR Task Force with 19 members representing 12 countries. The final document contained a specialty curriculum and training program for phlebology, including training requirements for trainees, instructors, and training centers. To receive the Competency Degree in Phlebology and the Competency Degree in Phlebological Procedures, a phlebologist needs to show defined goals of knowledge, skills, and competence in various assessments. The ultimate aim is to ensure the best quality of care of patients with venous disorders. To receive a European Diploma of Phlebology, the candidate fulfilling the stated criteria will have to pass a two-part test: a written multiple-choice test and an oral examination in both phlebology and phlebology procedures. With increased interest and awareness of the importance of venous disease and implementation of a curriculum, the demand for education and practical instruction on the management and use of modern techniques with clear learning objectives have increased. The ETR also outlined an instruction plan. 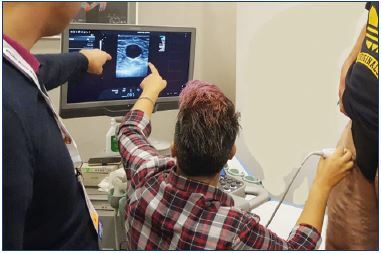 Training practices included practice with a hands-on phantom, demonstrations on live subjects, videos on procedures followed by analysis of techniques, management of case presentations, and attendance of “live” procedures. Requirements of centers and instructors to provide the necessary teaching and training are also outlined in the ETR. We are convinced that implementing this plan cannot be achieved without industry support in the form of unconditional educational grants. Perhaps it is time to reevaluate the educational impact and usefulness of instruction for various types of events. 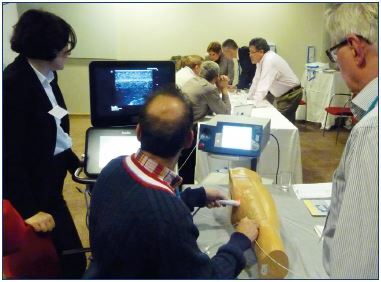 Although there are several symposia, congresses, etc, organized on vascular medicine, most are centered around presentations, discussions, and occasionally demonstrations on techniques rather than actual hands-on training. Most devote little time to venous disease, although lately this has increased. 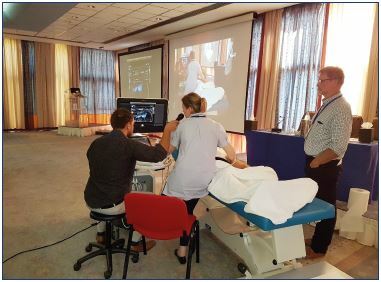 Although workshops were offered, the number of participants were low, the faculty few, and rarely did every learner put their hands on the devices and perform the procedure. No assessment of impact on the learners was generally performed. There is an increasing need and demand for more practical instruction on the management and use of modern techniques in a comprehensive manner. We believe that the European Venous Forum Hands-On Workshop (EVF HOW) shows a model of instruction, where these goals can be met. The first workshop was organized in 2010 in Larnaca, Cyprus and the last in 2018 in Limassol, Cyprus. •Realize when to refer a patient for higher-level care. Venous therapists have various background and specialties. Although not all venous therapists perform all procedures, it is considered important that venous therapists are familiar with various interventions and their applications. It is important to perform phlebology procedures skillfully, but it is also just as important to know when to refer a patient for higher-level treatment when necessary. The workshop should, therefore, be comprehensive and represent most types of interventions available. The founding academic organizing committee was familiar with the objective structured clinical examination (OSCE) used to test medical students. The learners are examined in a standardized wayin a circuit of short stations on clinical skills, such as reading an ECG, placing a urinary catheter, recognizing a murmur, etc. Candidates rotate through the stations, completing all the stations on their circuit according to a controlled time schedule. A grade is given based on how the learner fulfills a set of objectives at each station. This concept was adapted to construct a circuit of 24 workshop stations. Instead of being tested, the learners have structured hands-on training. Each station gives a short description of the content and 3 to 5 objectives to be reached. 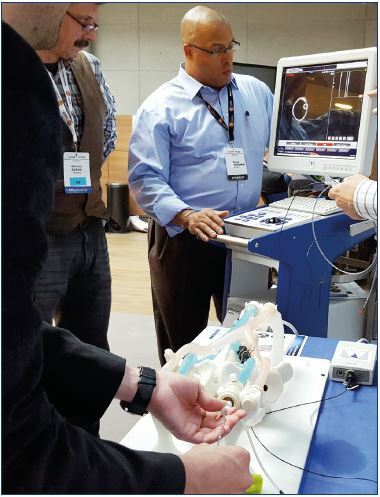 The delegates attend each station for 30 min in small groups (4 to 5 learners), giving each learner time to try out varying devices, practice applying bandages on each other, perform ultrasound scanning on patients, perform saphenous ablation on phantom models, etc (Figures 1 to 5). At least one faculty member provides the medical instruction at each station, working in collaboration with an industry expert who offers information about the product. other under the supervision of an instructor. on a vessel model with artificial stenosis. The all-day program is very concentrated and demanding for both learners and instructors. There is little time for extracurricular activities and the presence of the delegates is obligatory at all learning activities. Despite the “harsh” schedule, the learners have responded well. We have been particularly impressed by the hard work and constant input by the faculty. This workshop is not a meeting you flyinto, have a presentation, and then leave. The workshop requires a full 3-day commitment, in addition to traveling time, from each faculty member. The venous experts also share their contact information with the learners, providing support after the meeting if wished. Despite this commitment, most instructors have thoroughly enjoyed the workshop, especially the stimulation obtained by the frequent interaction with the learners. The majority of the instructors have returned when asked. Table I. The basic principles of the EVF HOW. Success has not been measured by the number of participants, as the attendance is limited, but by its impact on knowledge and practice. In 2014–2017, web-based tests containing 25 multiple-choice questions that needed to be answered within 30 minutes were performed before and after the workshops, each time with the same questions. The validity of the questions was assessed by letting the faculty take the test too. Questions that were doubtful were excluded from the test results. Table II lists the results from each year. The results have shown a substantial 29% to 50% median improvement in the scores. The result depends on the level of knowledge before the workshop. 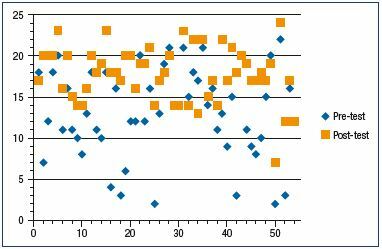 When the knowledge level is high, the percentage improvement between the pre- and posttest is of a lower magnitude and the number of those not improving at all increased. This is further illustrated in Figure 6 in a scatter diagram, which shows individual test results in 54 learners from the workshop in 2017. Table II. Results from the EVF HOW multiple-choice test before and after the workshop (2014—2017). In the general assessment of the workshop, >90% of learners indicated that the workshop would influence and change their clinical practice in the future. These results have been similar in all seven workshops, clearly indicating that the workshop has had the intended impact. the wide scatter of results prior to taking the workshop. In 2013, the EVF HOW–associated website was introduced as an additional learning tool. This platform is a web-based password-protected portfolio. Each learner participating in the workshop receives access to the presentations, important references and guidelines, case reports for discussion, videos of procedures, supplementary information about the workshop stations, and other study material. Access is available for 1 year after the workshop, which gives the learners a possibility to reinforce and enhance their learning experience. The response from the learners has been extremely positive. Most learners (80%) used the website before the start of the workshop and as many as 85% accessed it during the workshop, with 94% returning for up to 30 visits. In the assessment, all participants fully or partially agreed that the website was a valuable supporting tool, especially by giving access to the presentations online, having references and guidelines in pdf format available, and the ability to return to posted video material. The applications, multiple-choice questions, and course assessments are now incorporated into this website and performed online. The EVF HOW is also present on Facebook and Twitter. During the early EVF HOW workshops, learners frequently asked for the possibility to receive more in-depth instruction about details of various procedures in clinical practice. Therefore, the advanced EVF HOW Plus courses were created to offer an opportunity to improve various skill sets for venous therapists. These were started in 2015. In order to be accepted in the EVF HOW Plus courses, the learners should have attended an EVF HOW workshop. The main objective of these in-depth mini-courses is to ensure that the learner has sufficient skills to initiate the use of a procedure by providing detailed knowledge, simulator training, and preceptor ship in a clinical setting. 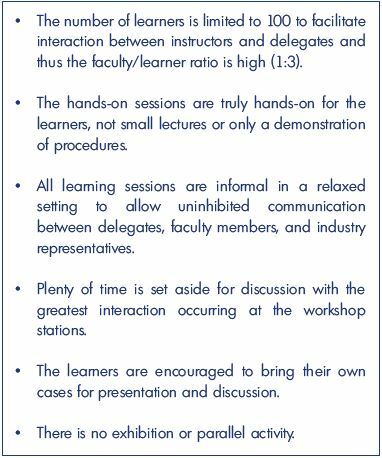 Most courses are 2 days with only 4 to 10 participants, depending on the type of subject, which often provides an opportunity for the learners to participate at the interventional/surgical table. These courses are set up by collaborations between the EVF and enthusiastic colleagues, who want to share their experience and devote time to instruction. For example, in Modena, Italy, Drs. Lugli and Maleti each arranged successful courses in venous stenting and deep venous valve repair, respectively. Each of these Plus courses had 4 learners, who were given the possibility of assisting in the procedures. The success of EVF HOW and EVF Plus could not have been sustained through the years without the support of dedicated faculty members and a strong commitment of industry partners. Although the necessity to cooperate with the industry may raise concern, in the end, the integrity and the scientific delivery of the workshop must be maintained by the organizing committee, who has the final say. Occasionally, the industry must look beyond an immediate “return on investment” after sponsoring individual events and shoulder its responsibility for teaching and increasing awareness about venous disease. In the longer term, this program will be beneficial for all stakeholders. Participation of the industry in EVF HOW has been a winwin situation for all involved. The learners have been provided with training material, phantoms, and models to practice on and close interaction with faculty members. The industry representatives are not only guaranteed to meet every learner, but also allowed to attend the scientific program, which has been greatly appreciated by industry representatives who are given the possibility of remaining up-to-date and participating in discussions and case presentations. Structured instruction and practical hands-on workshops with assessment, such as EVF HOW and EVF HOW Plus, are in line with the training practices outlined in the ETR in phlebology. The EVF can now not only provide an annual scientific meeting, but also hands-on training in a basic format (EVF HOW) and an advanced format (EVF HOW Plus). It would be of great value if a third step were developed by creating a network of venous centers to allow individual venous therapists to join them for a longer or shorter period for further advanced training. Although strictly scientific meetings are important, training needs to be complemented by small group, hands-on courses on the practical management of patients with venous disease. The industry, instructors, and the learners all agree on this. For detailed information regarding future EVF HOW and EVF HOW Plus events, go to www.evfvip.com. 1. Parsi K, Zimmet S, Allegra C, et al. Phlebology training curriculum. A consensus document of the International Union of Phlebology (UIP) – 2010. Int Angiol. 2010;29(6):533-559. 2. Venous Curriculum composed by the American Venous Forum (not published, personal knowledge). 3. European Union of Medical specialists (UEMS). Speciality training programme and curriculum for phlebology. European training requirements and European standards of postgraduate medical training. https://www.uems.eu/__data/ assets/pdf_file/0003/52518/UEMS- 2017.33-European-Training-Requirements- Phlebology.pdf. Accessed June 12, 2018. 4. Neglén P, Eklöf B, Nicolaides A. EVF HOW Education in Venous Disease on the Move The 7th EVF HOW is returning to Limassol, Cyprus Advanced courses, EVF HOW Plus, will continue during 2016. Int Angiol. 2016;35(3):353-363.